World 100 metres hurdles champion, Brigitte Foster-Hylton, is the fifth recipient of the Courtney Walsh Award of Excellence. She won the award at a glitzy award ceremony at The Jamaica Pegasus on Wednesday night to cap what she identified as the most successful season of her career. The 34-year-old won gold in the 100 metres at the IAAF World Championships in Athletics in Berlin, her first gold medal at a major meet, to join the illustrious list of sporting personalities who have received the award. The past winners are former West Indies cricket captain Jimmy Adams, Olympic 400m hurdles gold medallist Deon Hemmings-McCatty, netballer Elaine Davis and cricketer Nehemiah Perry, who were all in attendance. Foster-Hylton labelled the season as a dream experience and made special mention of her coach, Stephen Francis, who urged her to continue after she had decided to retire from the sport after constant injury setbacks and disappointment at last year's Beijing Olympics, where she could only manage a sixth-place finish in the final. "I'm truly overwhelmed to be receiving this award, it's an awesome honour to be joining the ranks of those giants who preceded me as recipients of this award. This is really the crowning moment of what has been a great season for me, the best of my entire career highlighted by my gold medal in Berlin," Foster-Hylton said. 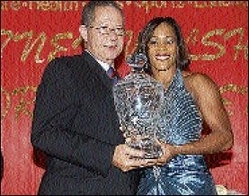 Foster-Hylton, who also won gold at the 2003 Pan American Games, 2006 Commonwealth Games and this year's World Athletics Final along with silver and bronze medals at the 2003 and 2005 World Championships in Athletics, respectively, expressed her delight to be associated with an award that recognises the achievements of Courtney Walsh. "I feel privileged standing beside him taking photos and receiving an award which is named after him," Foster-Hylton beamed. Prime Minister Bruce Golding, who delivered the keynote address, also paid tribute to Walsh and congratulated all the nominees. "It is so wonderful for them (nominees) to be honoured in the name of Courtney Walsh, as he remains such a powerful and inspiring icon for all of Jamaica, and especially our young people. The Courtney Walsh Award, it's not looking at an event, it's not looking at how many runs you score in a match or the times that you recorded in a race or how many goals you score in a netball game. It looks at the development of an athlete over time, and not just at their achievements but looks at so many other things," said Golding. Courtney Walsh, who announced his intention to set up a charitable organisation to assist incarcerated youths, congratulated each nominee and hailed their hard work and dedication to their areas of sport. Said Walsh: "It is indeed a pleasure to once more recognise the triumphs of my colleagues who give their all to their chosen sport. This is a journey that can be challenging and bruising at times. These nominees have given real meaning to the word 'success' and each and every one of them is truly deserving of the recognition." Other nominees were Arnett Gardens Football Club player/ coach and former national representative Fabian Davis, cricketer Gareth Breese and Reggae Boyz goalkeeper Donovan Ricketts.